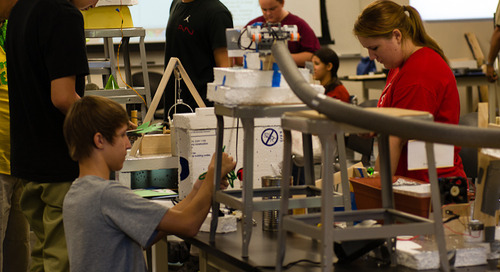 Making and DIY platforms are now impacting university engineering programs across the country. MIT has even begun accepting maker portfolios as part of their admission process! Arizona State University is now using Arduino and Raspberry Pi in coursework and co-locating classroom facilities in a TechShop makerspace for greater access to prototyping facilities, transforming the way the university conducts engineering education. Makers and Arizona State University Fulton Schools of Engineering Assistant Professors Shawn Jordan and Micah Lande are two ASU Polytechnic campus faculty integrating DIY into their programs. Jordan, also a Rube Goldberg Machine past Guinness World Record holder, has a background in electrical engineering, and teaches embedded systems classes with a special focus on real-world applications. Lande has a background in mechanical engineering design, and his coursework is focused on human-centered design, manufacturing, and engineering innovation. Lande also founded the first Maker Corps (makered.org/makercorps) site in Arizona. They use DIY projects as learning platforms in the classroom, and study the maker community and its relation to the everyday practice of engineering. "From our first-hand experience, we both believe that engaging in making has significant value in connecting theory to practice and exciting students about what it means to be an engineer," Lande says. "Most engineering programs do this at the capstone level; our program does it all four years, and our research explores how to further bring making into engineering education." Jordan and Lande say DIY platforms like the Arduino and Raspberry Pi are extremely popular in robotics and maker clubs at the university, and the platforms are used throughout students' engineering academic career. As freshmen, their students build projects like elevators with Arduinos. Sophomores create science and engineering exhibits with the Arizona Science Center based on Arduinos. Jordan's junior-level embedded systems project courses have students generating their own project ideas within a particular context, such as inventions with business plans, wearable electronics, and Internet of Things (IoT) devices, using the Raspberry Pi and Cypress's Programmable System-on-Chip (PSoC) platform – an ARM core and programmable analog and digital components in a single FPGA (Figure 1). Industry- and community-sponsored capstone projects also sometimes use Arduinos. "This format engages students to make their ideas a reality, and to become lifelong learners by determining what they need to know and motivating them to learn beyond the minimum requirements of the course," Jordan says. Both professors are also involved in research on what making means to people and how it can foster interest and success in regular engineering. Jordan and Lande conducted nearly 50 interviews at Maker Faires in the U.S. to find "educational pathways in and around engineering, and the knowledge, skills, and attitudes developed during their making activities." They found that making can encompass the act of creating and building just about anything, and it should be what they call "additive innovation" – contributing to the open maker community of sharing and learning. "Citizenship in the maker community means additively building on the world of others and freely sharing knowledge and processes back with the community," Jordan says. "The making community is an additive innovation network, both as a social and intellectual community." Playful invention and creativity are hallmarks of the maker community and their projects, driven by makers' personal interest. It's also a community where failures are celebrated as learning experiences. All of this bodes well for making's influence on the National Academy of Engineering's vision for "The Engineer of 2020." "Makers demonstrate lifelong learning, practical ingenuity, and creativity by the action of making itself, and their contribution to additive innovation networks," Lande says. Though their research initially focused on adult makers, Jordan and Lande have expanded it to include young makers and their educational and career ambitions. In future research they plan to explore making and STEM (science, technology, engineering, and math) pathways and inform engineering education efforts. In addition, parents of young makers and their role is their next target of study. "For young makers, parents are additional, active members of the additive innovation network, supporting their children financially, technically, logistically, and emotionally," Jordan says. "We plan to expand our interview strategy to include parents, as they have strong opinions about the benefit of making for their kids." Overall, they see the maker movement as a positive influence on engineering education and the future of engineering. "The democratization and availability of building tools make such things more accessible and available, in the classroom and more broadly," Lande says. "More and more, we have students arriving at college with significant experience creating and building complex systems – that allows for us to dive deeper into not just what can they make, but what should they make. We can teach closer to more authentic engineering practice." Shawn Jordan is a Rube Goldberg Machine champion, founding one of the most successful collegiate Rube Goldberg Machine Contest teams at Purdue University, leading teams to two national championships, and influencing future success with his design process and strategies. He has held a Guinness World Record for the world's largest Rube Goldberg Machine (125 steps), and one of his machines was even featured in a movie. Jordan has made television appearances on Modern Marvels on The History Channel, Jimmy Kimmel Live, and served as a behind-the-scenes engineer for PBS's Design Squad engineering design reality TV show. Aside from being fun to build and watch, Jordan sees Rube Goldberg Machines as similar to embedded systems and making. "I see Rube Goldberg Machines and embedded systems as being very similar, particularly when using platforms like Arduino and Raspberry Pi," Jordan says. "Both are systems of systems. Rube Goldberg Machines are typically designed in modules that link together into a single chain reaction, where each module senses something (electrically or mechanically) and triggers an action based on the input. Embedded systems are similar in that they are made up of sensors, actuators, and processing elements. When building a Rube Goldberg Machine, you are both a subsystem designer and a systems integrator. 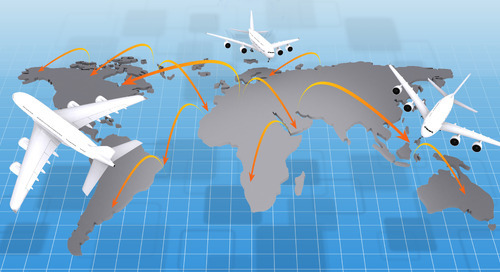 Products designed by makers similarly require systems integration." See more about how Jordan is using Rube Goldberg Machines and building creative projects to teach engineering skills in the September Community Outreach column.